Posted: January 9, 2016 2:00 a.m. Updated: January 9, 2016 2:00 a.m.
Explorers Post 747 has the distinction of graduating private pilots at a rate that’s twice the national average. That alone is hardly a track record to sneeze at, but the really amazing thing is that they’re all high school students. Based out of Whiteman Airport in Pacoima, Post 747 was founded 13 years ago by aviation enthusiast Ruth Logan. In 2002 the longtime pilot was approached with the intriguing idea of starting a local aviation chapter of the Explorers, a career-based program originally affiliated with the Boy Scouts of America. For Logan, the Post would become a labor of love, one more way to open the skies to the next generation­ of pilots––including those who might otherwise have never been afforded such an opportunity. The concept blended well with her longstanding commitment to the Young Eagles Program, a once-a-month event that is held at Whiteman Airport. Sponsored by the Experimental Aircraft Association (EAA), Young Eagles introduces young people to the thrill of flight. Free rides are offered to youngsters ages 8-17. With such notable past presidents as Harrison Ford, the EAA program is supported by generous donations and a national squadron of volunteers. Over the years Logan has flown more than 300 kids. Among those is former Explorer Jesse Galeas. The son of a day laborer, he rode his bike to the airport, scrubbed floors, traded odd jobs for lessons, and also earned his pilot’s license. Moises is now six-foot, three. He adds that in the 9th grade he did a report on the history of aviation from WWII to the Cold War, including a section on Manfred von Richthofen, the notorious Red Baron. It fanned the still burning embers of his wanting to fly. Midway through 2014, a friend happened to mention her involvement with Explorers Post 747 and invited Moises to a meeting. It was a match made in heaven. Active from the very beginning, he dove into ground school and soloed at just 12 hours. 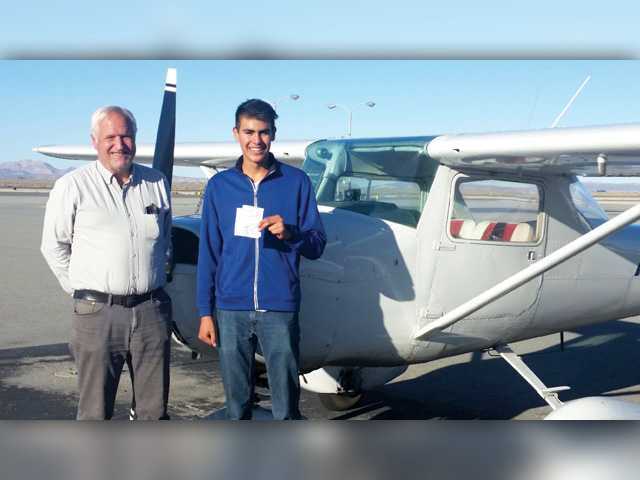 On a spectacular fall day in 2015, with 45 hours in his logbook––40 is the minimum required by the FAA, and the average is closer to 60 hours––Moises flew a Cessna 150 to Fox Field, an airstrip in Lancaster, to take his check ride. Clear blue sky stretched as far as the eye could see. Not a wisp of cloud or a ripple of wind. A perfect day for flying. Family and friends who had come out to the airport had taken up four tables in the coffee shop. They waited, and waited. An extensive oral exam was followed by time on the ground with more questions about the plane. After an hour, Moises and the examiner were airborne, shrinking to a tiny speck in the sky before disappearing altogether. Ninety minutes later they landed and returned to the hangar to finish up the exam. His flight instructor, Ted Ripp, also at Fox Field that day, paced. Six hours had gone by before Moises emerged with a grin and a thumbs up. He’d earned his wings. His parents’ eyes glistened. His sisters bounced along beside him. His 84-year-old grandfather, visiting from Mexico, was proud beyond words. 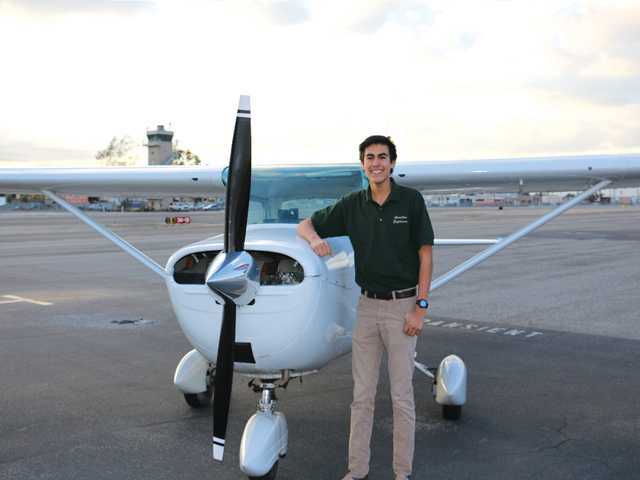 When Moises flew home from Fox Field back to Whiteman, his grandfather––who had never before flown in a small plane––had the honor of being his first passenger. He comes from the kind of family you’d like to have living next door. 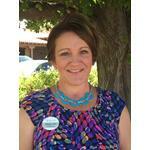 Gracious, hard-working, and community-minded, they are living the American Dream. His mother, Miriam, is a stay-at-home mom, and his father, Martin, a waiter, emigrated from Mexico and met her on a dance floor in Los Angeles. A first-generation American, Moises, who wants to become an airline pilot, will be the first member of his family to ever attend college. “Without this program we couldn’t see this happening financially,” Miriam said, praising the Explorers. She is one of the powerhouse parents who helps to keep Post 747 going strong. The inspiring stories now go on and on, but getting the Explorers program off the ground in the first place came with hurdles that would have obliterated the resolve of most. Logan is made of tougher stuff. To launch the Explorers, she needed a charter, non-profit status, a meeting facility, insurance, a plane, a way to raise thousands of dollars for flight training, and a community outreach program that would find eager young pilots in waiting. But funding remains an ongoing issue. A pilot’s license runs upward of $5,000, if all goes according to schedule––more if training takes longer. The local Ninety-Nine’s pony up scholarships of $2,500, half the average cost, but each Explorer who pursues a license is responsible for the balance. Explorers are constantly fund-raising by hosting pancake breakfasts and airplane washes. The more money that is made available increases the opportunities for these good kids to achieve.